COMEDK Result 2017: The results for the Consortium of Medical, engineering and dental of Karnataka (COMDEK) will be declared on 29th May 2017. Aspirants can check and download the COMEDK UG Entrance Test Result 2017 on the official website. The rank list for the COMEDK will be prepared on the basis of the marks obtained by the aspirants in the entrance exam. From 2017, COMEDK will be conducted only for the engineering and architecture admissions in the state of Karnataka. There will be around twenty thousand seats will be filled in 150 engineering colleges through COMEDK 2017. 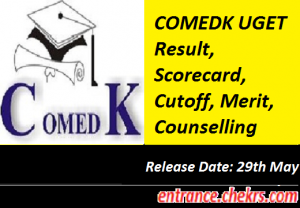 Aspirants who will qualify the written exam and will be able to get their name in the COMEDK merit list will be called for the COMEDK UGET Counselling 2017. The counselling will start in the month of June 2017. The score card for the COMEDK 2017 will be available on the official website. Aspirants can download the COMEDK Merit List 2017 after the declaration of the results. The COMEDK results will be declared on 29th may 2017 and the official answer key will be released on 26th May 2017. Aspirants can check their answers by matching with official answer key and can get their expected marks by this process. The test score card will be available online on 29th May 2017, aspirants can download their scorecard by following given steps. Open the official web portal of COMEDK, i.e. comedk.org/. Click on the UGET 2017 result link. Fill the desired login id and password. Download the result and also take a printout of the result for counselling purpose. The aspirants who will clear the cutoff marks will be only eligible for the counselling process. A merit list will be prepared for such students according to the COMEDK UG Entrance Test Cutoff 2017. Last year the topper scored 170 marks out of 180. The Cutoff will depend upon many conditions like the number of students appeared in the examination, the difficulty of exam etc. There are some records for the last year cutoff and they are given below. After the declaration of the results, a merit list will be prepared by the authorities for the shortlisting of the students. The COMEDK UGET Merit List 2017 will be published along with the result declaration i.e. 29th May 2017. All the aspirants who will get shortlisted will be called for the counselling process. The merit list will be based on the marks obtained by the candidate in the entrance exam. The merit list will be the final lost for the result, further there will be no changes can be done in the list because it is prepared by a team of experts. The students who will clear the required cutoff marks that are pre-defined by the authority will be called for the COMEDK Counselling 2017. The counselling process will start in the second week of June 2017 and an email will be sent to the registered id of the selected students regarding the counselling process. The COMEDK Seat Allotment 2017 will be done on the day of counselling, the aspirants will be allotted on the basis of their ranks and preferences. There will no information about the result or counselling will be sent through post to the students. For more feedback and queries regarding the COMEDK UG Entrance Test Result 2017, you can contact us by commenting in the comment section given below.